M7 Pan & Tilt LWIR Uncooled / MWIR Cooled Long Range Thermal PTZ FLIR Imaging camera for mobile EOIR Defense, UAV/Drone Detection, border, coastal, security & Surveillance. The affordable high speed, all terrain M7 LWIR & MWIR Pan & Tilt Now available with 50+KILOMETER DETECTION RANGE Performance ! CONTACT US at sales@x20.org for additional information. The M7 Series of thermal imaging PTZ flir camera are custom built with COTS Hardened lenses to achieve your detection range requirements, the system can accommodate a wide array of LWIR and MWIR Continuous zoom Lenses Image enhancement and correction features offer you the absolute best sensitivity and quality. THAT OFFER OUTSTANDING PERFORMANCE WITH MAINTENANCE FREE TOP GRADE MILITARY COMPONENTS WHICH PROVIDE YEARS OF RELIABLE IMAGING. Tight Precision Coated/Hardened Continuos zoom Thermal Imaging Germanium Lenses are incorporated into the M7 LWIR system at F/1.2 Aperture, Optional MWIR F/4 Aperture optics are available, Extreme long range night vision target detection in pitch darkness and harsh environments can present a challenge. The M7 PTZ EO/IR PTZ FLIR Thermal infrared imaging camera platform can achieve advanced detection, recognition and identification of distant targets at very long ranges with extreme accuracy and precision with highly sensitive, high resolution sensors, Our affordable high sensitivity steerable PTZ flir Thermal imaging systems can be configured with long range germanium telephoto zoom Lenses that offer target detection at 50 KILOMETER + RANGE. 15-225 mm MWIR INSB cooled thermal continuous zoom hardened, coated/sealed germanium lens. 18-335 mm MWIR cooled INSB thermal continuous zoom hardened, coated/sealed germanium lens. 35-670 mm MWIR cooled INSB thermal continuous zoom hardened, coated/sealed germanium lens. 35-720 mm MWIR cooled INSB thermal continuous zoom hardened, coated/sealed germanium lens. 35-835 mm MWIR cooled thermal continuous zoom hardened, coated/sealed germanium lens. 88-1420 mm MWIR cooled thermal continuous zoom hardened, coated/sealed germanium lens. 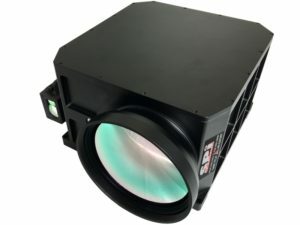 15-305 mm MWIR cooled thermal continuous zoom hardened, coated/sealed germanium lens. 47-595 mm MWIR cooled thermal continuous zoom hardened, coated/sealed germanium lens. 88-1220 mm MWIR cooled thermal continuous zoom hardened, coated/sealed germanium lens. 55-1650 mm MWIR cooled thermal continuous zoom hardened, coated/sealed germanium lens. 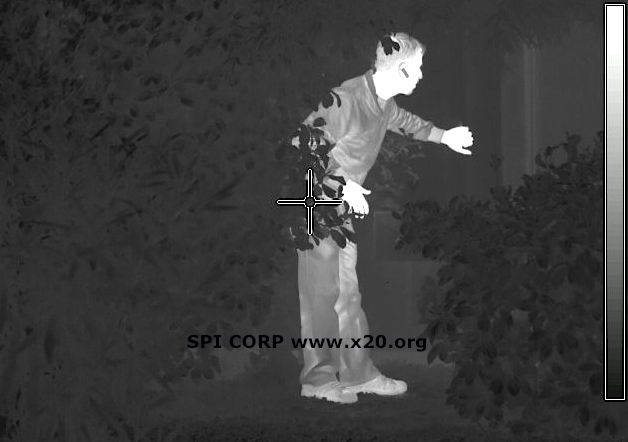 SPI GUARANTEES THE ABSOLUTE BEST PRICING FOR LONG RANGE THERMAL PTZ FLIR IMAGING RECONNAISSANCE OBSERVATION SYSTEMS! 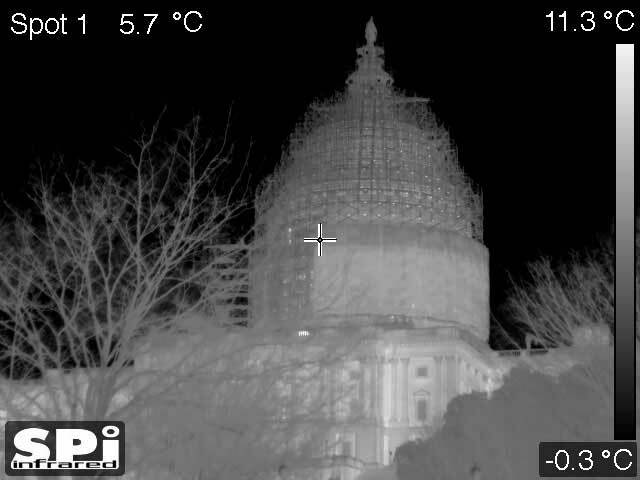 The M7 is the easiest thermal pan tilt zoom Instrumentation camera system to install. Integrates simply with all security systems. FULLY UNIVERSAL AND COMPATIBLE WITH RADARS + ANY NETWORK INTEGRATION SCENARIOS WITH WIRED, VOIP, Video over Internet Protocol, LOCAL, REMOTE, IP, STREAMING, ONVIF, POE POWER OVER ETHERNET, ANALOG, ETHERNET, SOLAR, FIBER, RECON, SLEW TO CUE, VEHICLE, MOBILE, CAR, VESSEL, MAST MOUNTED, TELESCOPING TRIPOD MOUNTED, WIRELESS, UNMANNED, REMOTE DEPLOYMENT, DATA, FIBER OPTIC, GPS, DMC, RADAR, MICROWAVE INSTALLATIONS. If your application calls for high reliability pan/tilt PTZ, ultra extreme MWIR or LWIR FLIR long range day/night imaging system, then the M7 if your clear choice. There are many Long Range Imaging systems available in the marketplace, although one drawback is the cost. The M7 PTZ flir pan & Tilt Gimbal payload camera system is priced substantially lower than its competitors and offers true optical long range optronics imaging in low light, day and night. Laser Pointers/illuminators and rangefinders are all available in medium, long and very long ranges. The M7 Has a very rugged, sealed all weather 100% duty cycle metal payload PTZ Pan Tilt Positioner with zero backlash and extreme positioning precision. 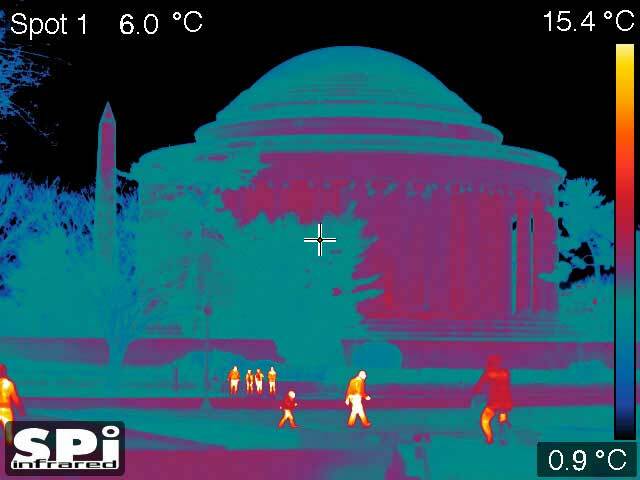 will consult with you to build the perfect thermal infrared imaging PTZ system at the absolute BEST PRICE ! 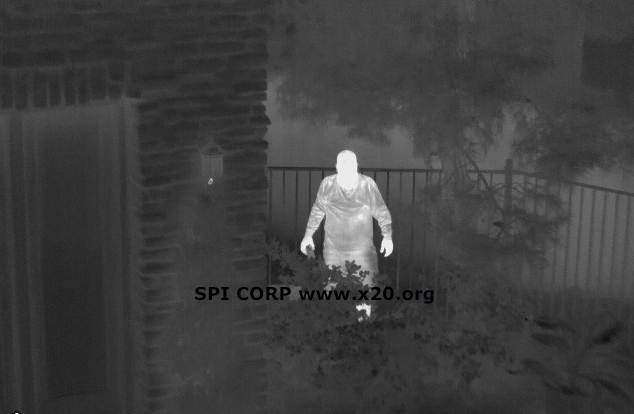 SPI Encourages you to shop around for quality long range multi sensor FLIR thermal Imaging cameras coupled with HD zoom telescope EOIR optics & multi sensors, you will not find a comparable long range PTZ FLIR camera solution that performs as well as the M7 camera does for the price offered. Long Range thermal Imaging EOIR Pan Tilt sensor systems are an exotic detector/lens and positioning platform that allow for extreme range remote sensing application in a wide variety of security, surveillance, remote wireless and research applications. The M7 has a proven track record of being the most reliable and highest performing system available anywhere. With an assortment of imaging sensors such as NIR, BsTFA, SWIR, MWIR and FLIR detectors integrated into the M7, the unit is a one package solution that solves a wide array of imaging needs. The M7 can also be outfitted with active gunshot detection arrays, LIDAR, custom rugged fixed, vehicle mast mounted solutions, mapping, tracking and analysis imaging & thermography temperature measurement radiometric options. The M7/Z variant is specifically catered for UAV/Drone Detection. 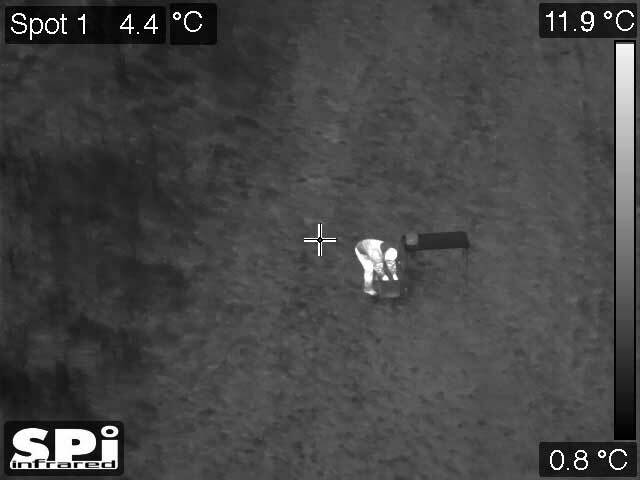 Access to drones in todays world is a major concern, inexpensive UAV’s coupled with powerful daytime and thermal infrared imaging FLIR optical cameras and lasers allow rouge individuals and terrorist organizations a huge tactical advantage in day/night aerial imaging, surveillance and airborne reconnaissance. The M7/Z has the capability to detect in day or night mini, small, medium and large Unmanned Aerial Vehicles, UAV’s, UAS, sUAS, multicopters, quad-copters, hexcopters like the DJI line of uav’s and a wide variety of unmanned Drones. The M7 is available in LWIR (Long wave Infrared) and MWIR (Medium Wave Infrared) cooled sensor configurations, general micro pitch on the detector is 15 Um. 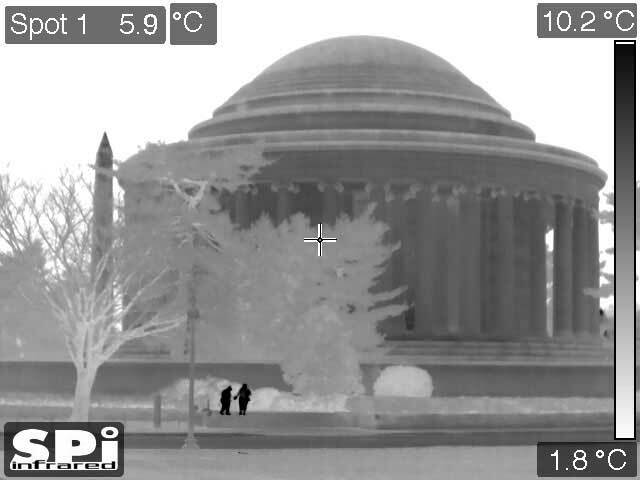 For customers that need Medium to long range thermal infrared IR FLIR imaging, We offer the LWIR Long Wave uncooled 7-14 micro sensor version of the M7. For those demanding applications that require exotic long range, and Ultra Extreme long range IR FLIR Thermal Imaging Range, The M7-X MWIR Mid Wave Infrared is available in a wide array of lens options up to effective 2000MM focal length at F4. These Detector and lens combinations offer the longest range performance at the highest resolution and sensitivity. 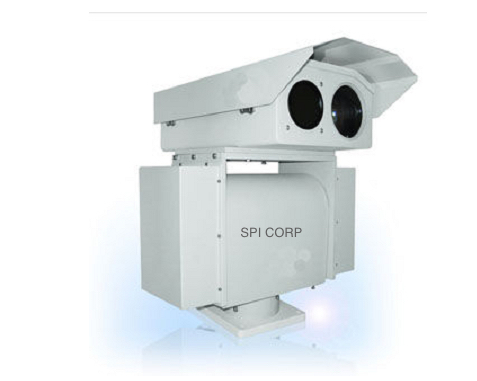 These type of cooled thermal imaging FLIR IR systems payload turrets offer hardened cz telephoto optics, SPI ensures you the best value and most affordable priced long range Thermal FLIR PTZ imaging solution. Contact us if your application is a brand new one or if you would like to integrate and incorporate into an existing security system, our knowledgeable engineers will guide you every step of the way to build and design a high performance, effective and affordable robust security platform. 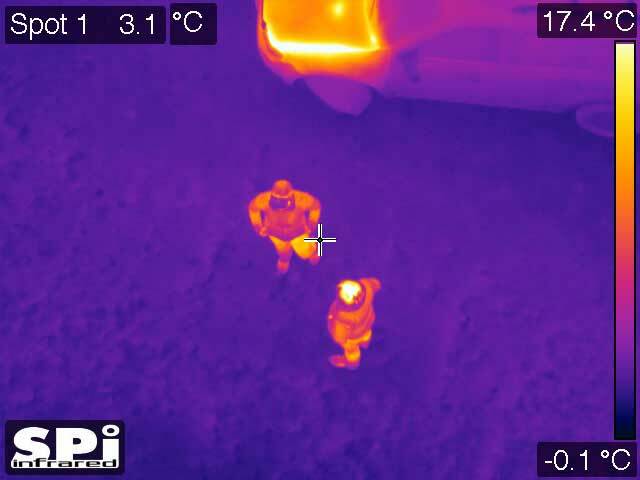 Our M7 LWIR Thermal PTZ FLIR and has no cooler internally, it uses all solid state electronics which ensure long life, and is maintenance free, Our LWIR thermal imaging sensor detectors offer advanced pixel pitches which when coupled with our long range lenses will offer impressive detection, recognition and identification performance. We offer you the best price on our continuous optical thermal zoom cooled thermal imaging PTZ flir cameras. The M7 GPS Geolocating Telescope FLIR thermal imaging LWIR uncooled PTZ camera can be custom configured to your exact application and specification, with a wide array of HD TV, CCD, CCTV, CIS, Telescope Thermal, NIR, SWIR, VNIR, LWIR, MWIR & FLIR Optics, the M7 system will definitely suit your needs from medium, long to Very long range security, surveillance and imaging needs. Optional Slew to cue Radar integration, solar, remote, gps, fiber, microwave, wireless, ethernet, ip, ONVIF, POE, RS485, RS422 serial digital compass installations are available for the M7 PTZ Turret. We offer the worlds most accurate Laser Range Finders (LRF) integrated into our systems with detection ranges of over 50 kilometers. NEW OPTION – Ultra Low Light HD X26 HFIS imager optimized to 1100 NM for SeeSpot 1064 (Link for the X26 Hyper Fidelity Intensified Sensor HFIS) can be outfitted to the M7 for additional imaging performance, X26 HFIS option is available ONLY FROM SPI and offers unbelievable HD imagery in day and Night ! The M7 features 360° continuous pan tilt zoom surveillance at an up to HD High Definition 500x zoom for maximum performance in even inclement conditions & harsh environments. Contact us for options & pricing! The M7 long range thermal imager is a long range Multi Axis Gyro Stabilized multi channel EO/IR Multi Channel/Sensor all weather PTZ LWIR long wave / MWIR mid wave infrared / CMOS cctv surveillance, security and detection system on our product roster. 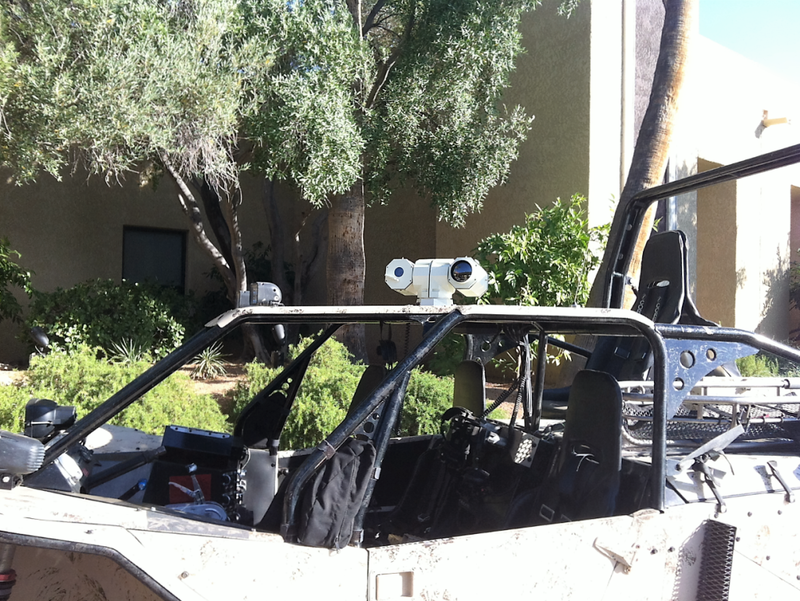 This PTZ flir pan tilt zoom multi-sensor system doesn’t mess around when it comes to your most rugged applications. This Rugged/all weather 100% Duty cycle, mountable camera system features both a daylight TV LLL camera and a super high resolution LWIR or MWIR thermal sensor combined to give you up to 500x zoom. Combine that with the 360° continuous pan tilt zoom function and you have the most well-rounded, all condition 24/7 surveillance camera system for maximum distance footage at any time of day or night. This system is easily mounted on vehicles, boats, marine vessels, masts, buildings, and its included stabilization platform optimizes it for whatever application you need to utilize it for. The controls are simple for any user to navigate and the system has an integrated wiper system, the unit represents the ultimate in extra long thermal imaging security / surveillance. The M7 LWIR / MWIR PTZ Multi channel, multi sensor flir thermal imaging camera is a sealed totally Stealth & covert military grade long Range FLIR thermal imaging PTZ Pan Tilt camera system that emits no laser or illumination at all making it completely stealth and unseen to enemy night vision devices. 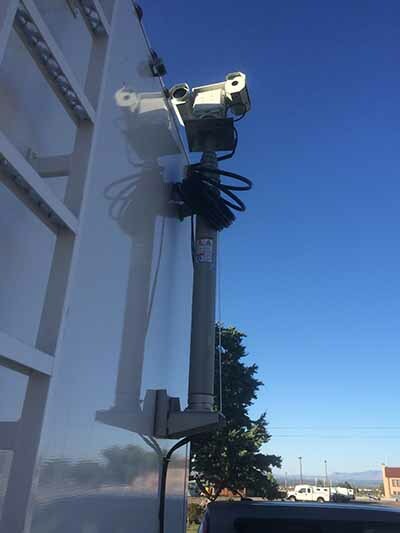 We can assist if your solution required a telescoping mast, the M7 has been installed in many mast mounted programs for border, law enforcement, military and vehicle applications. 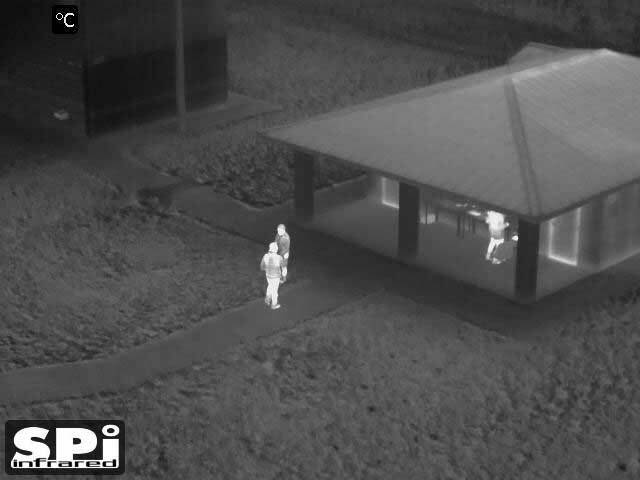 Having the luxury of a mast increases the LOS (line Of Sight) imaging performance of thermal imaging PTZ IR night vision cameras. Optional audio microphones, shot/sniper detection and speakers are available if your application calls for Audio implementation. Extremely accurate and rugged PTZ Pan Tilt Zoom PT motors and Gears, 100% Duty Cycle system, Zero Backlash, Extreme pinpoint movement especially at very long distances. 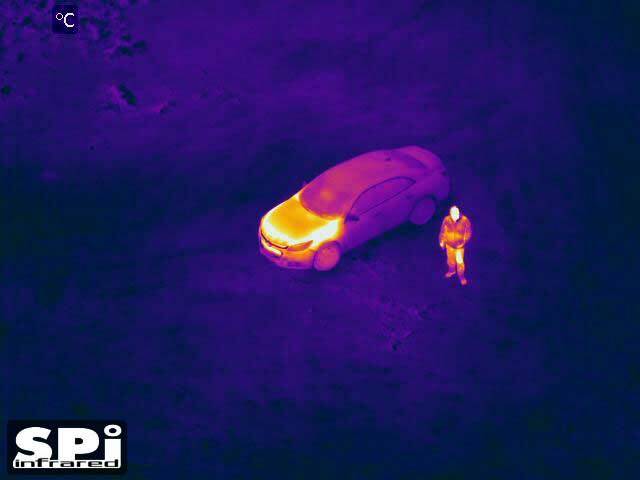 The M7 PTZ flir long range thermal Ir infrared camera is a sealed, all weather ruggedized platform that is fully universal in any situation. It is structured with an open architecture, which allows plug and play rapid hookup and operation in any conditions. Any time of day or night for maximum situational awareness force protect, security, surveillance and asset protection. 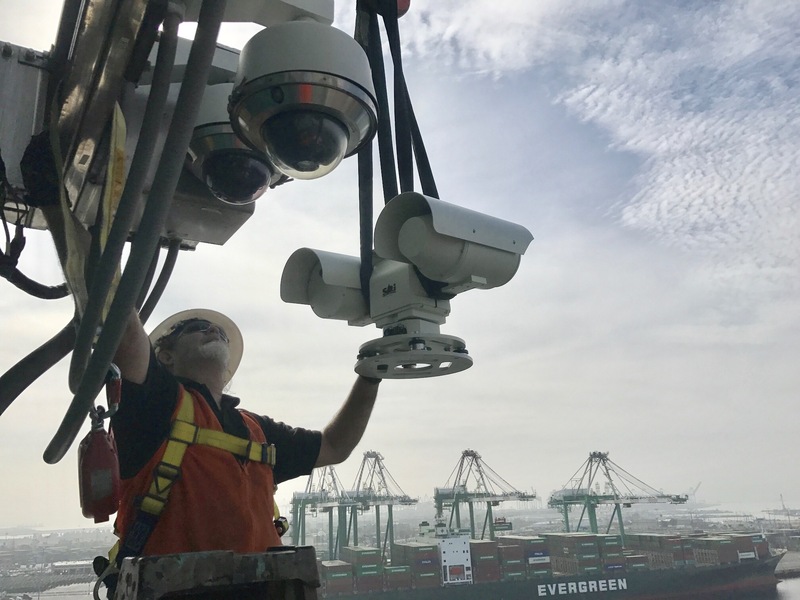 The m7 PTZ flir long range thermal surveillance system features the ultimate in uncooled LWIR / MWIR technology, this highly reliable, maintenance free unit assures you continuous operation for many years to come. The M7 is 100% reliable and solid state, and lasts longer than other systems on the market today. The unit is fully sealed and ruggedized for use in any harsh environmental conditions. Our extra long range PTZ flir thermal imager units have been deployed in every situation, from combat missions in the Middle East to security operations at vital facilities nationwide. 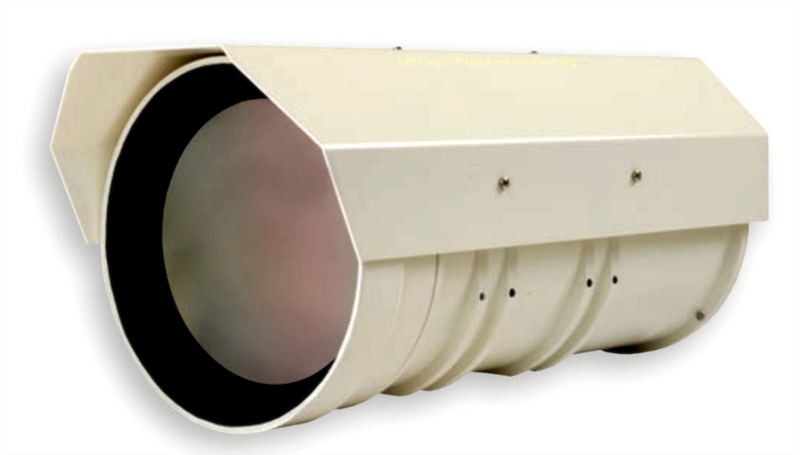 These systems are unparalleled in their performance and compatibility with existing surveillance networks, their resiliency in inclement conditions such as rain, fog or snow, and offer target of interest detection ranges up to 50 Km+ making them a superior extreme standoff distance system in thermal imaging cameras technology today. 320×240 QVGA, 336×244 QVGA, and the industries most sensitive VGA 640×480 and 640×512 Thermal Imaging detectors, XGA 1024×768 HD 720P Thermal Imaging Detectors available. NEW OPTION– Ultra Low Light LONG RANGE Day/Night HD X26 HFIS imager optimized to 1100 NM for SeeSpot 1064 (Link for the X26 Hyper Fidelity Intensified Sensor HFIS) / The X26 HFIS Camera is the Ultimate Day/Night HD imaging camera that offers unmatched performance in full daytime and very dark night time applications. The HFIS has Generation 3 Image Intensified image quality and sensitivity, without having the inherent problems of traditional image intensified systems, full sunlight and high energy scenes do not disturb the X26, with its super wide dynamic Range and ultra sensitive 1100 Nm detection capabilities. The M7-X Can be integrated with the X27 high fidelity color night vision sensor. The X27 is a revolutionary real time color HD 10 megapixel low light/low lux color night vision sensor that can image down to extreme 1 millilux night time scenes. 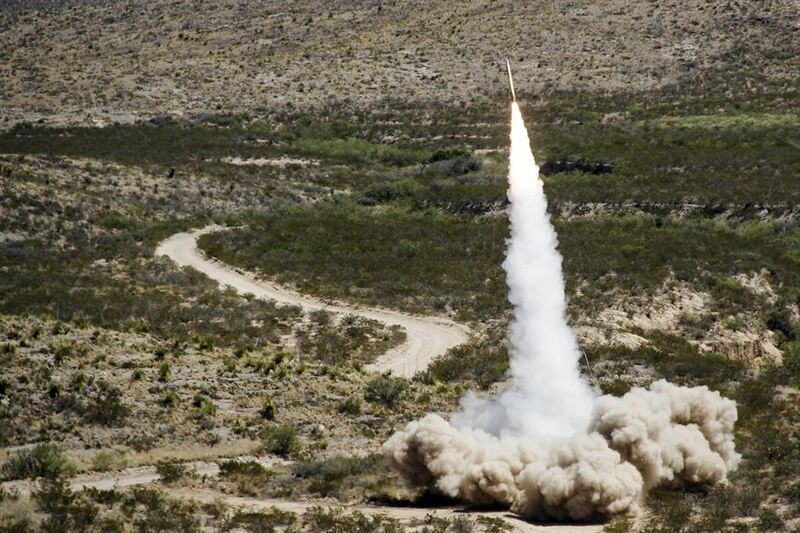 Detection range +/- 10 km, +/- 20 km vehicle or vessel LWIR Target Detection / UP To 50 KM Detection Range with M7-uX MWIR & 60 Kilometer Vehicle, Large Vessel and Aircraft Ultra Extreme Long Range Detection Ranges. Steerable positioner Gyro Stabilized Multi Axis, 150m/s2 11ms anti impact shock, zero backlash, 100% duty cycle, sealed with titanium gears, aircraft aluminum, all weather. 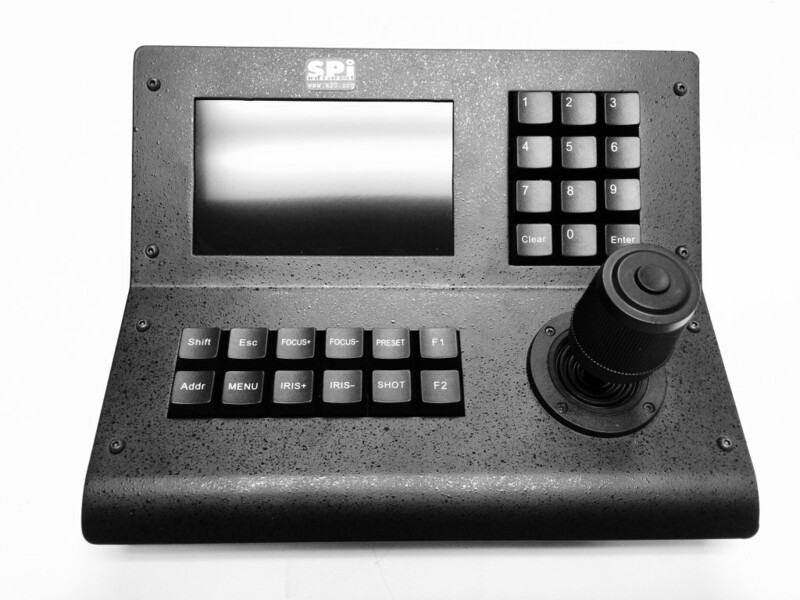 THE M7 IS FULLY SUPPORTED BY SPI, UNMATCHED 24/7/365 SUPPORT IS ALWAYS AVAILABLE TO OUR CUSTOMERS! M7 long range thermal imager color palettes. The M7 Ultra Long Range Thermal PTZ FLIR system comes with hand selected, top of the line military grade MWIR or LWIR cooled or uncooled detector arrays that go through rigorous testing and ensure extreme high resolution and High sensitivity. The M7 Has both LWIR F/1.2 Continuous Zoom and MWIR F/4 Lenses catered to your range requirements, Our lenses are top grade hardened, coated and sealed with high precision continuous zoom mechanisms. Our optics keep in focus throughout the entire zoom cycle from wide to telephoto fields of view. Our Daytime optics come in SD or HD and 4K, with optical CCTV lens solutions up to from 25mm to 2500mm, Our lenses really reach out to insane long ranges! Gyro Stabilized multi axis system w/Advanced “slip-ring” design lets the M7 PTZ FLIR IR CAMERA and its Multiple sensor payloads rotate continuously in either direction to stay locked onto the target. Slue to cue Radar and target tracking is available. 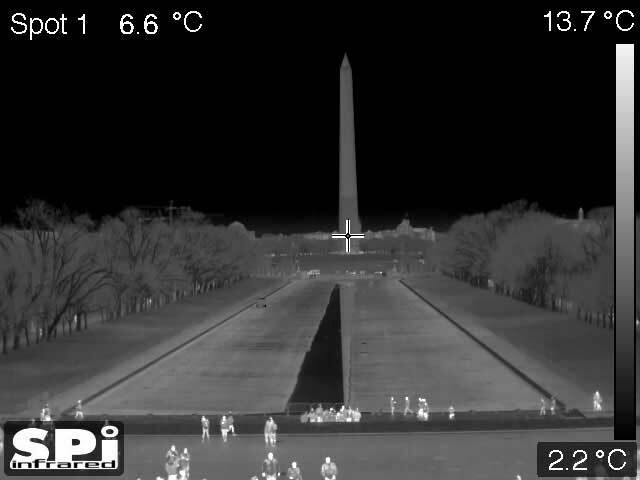 The M7 PTZ FLIR incorporates next generation Sensor Technologies, we use the latest Military grade sensors and can integrate exotic sensors to compliment the thermal and TV day optics. Optional Cameras include SWIR, BsTFA, HFIS.We can also custom integrate your specific sensors/cameras into the M7 System. Included is Continuous electronic digital zoom and a wide array of image enhancing and correcting algorithms that assure you the best image performance. 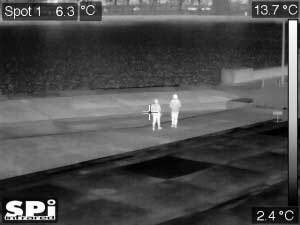 The M7 thermal imaging IR security camera is based on an intelligent PTZ platform that can be user programmed to follow pre set tours. The M7 is an all weather solution. An integrated wiper keeps dirt and debris from clouding your image. The M7 is the easiest thermal pan tilt zoom system to install. Integrates simply with all security systems. FULLY UNIVERSAL AND COMPATIBLE WITH ANY NETWORK INTEGRATION SCENARIOS WITH WIRED, GPS, LOCAL, REMOTE, IP, STREAMING, ONVIF, POE POWER OVER ETHERNET, ANALOG, ETHERNET, SOLAR, FIBER, MICROWAVE INSTALLATIONS. The M7 PTZ FLIR configurations include long range thermal, HD Thermal Imaging LWIR and MWIR detector arrays, network interface, mast mounted, slew to cue, drop deployable, Radar, Panoramic imaging, marine, emergency response vehicle, tactical vehicle, surveillance truck, border, sea, coastline and more with EO/IR add-ons such as NIR, SWIR, MWIR, LRF LASER RANGE FINDERS, SCMOS, LOW LIGHT CMOS, BSTFA, HFIS, LASER IR INFRARED ILLUMINATORS, POINTERS, DESIGNATORS, DAZZLER & SPOTLIGHT, tracking, GPS picture in picture, fusion & image blending. 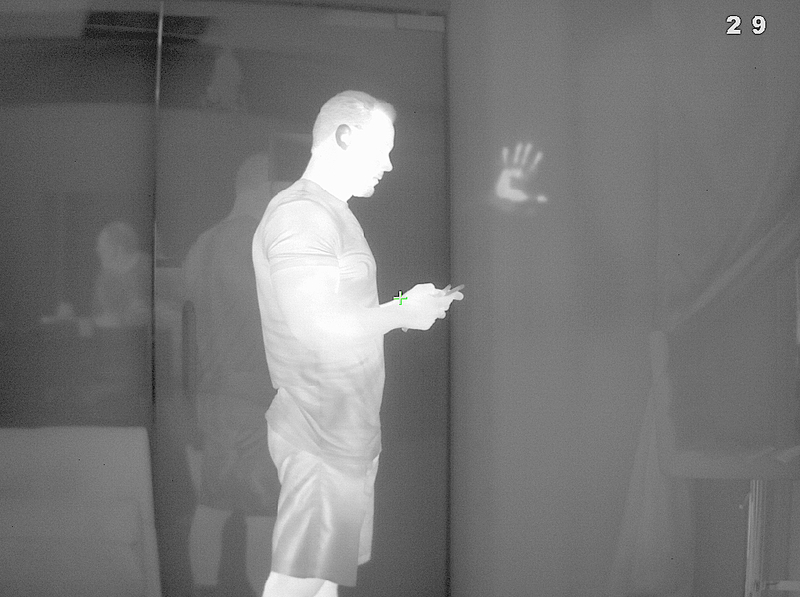 Exotic Thermal imaging and multi sensor systems such as the M7 are a significant investment, SPI offers you the best performance to price Value. We strive to offer our customers the absolute best equipment & support at the absolute best price. Contact us for our COTS or CUSTOM solutions. 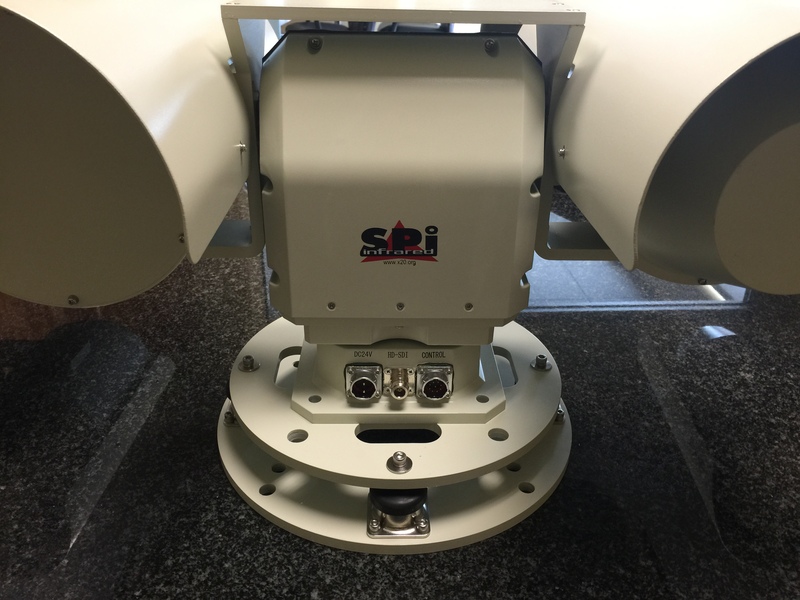 SPI Custom Build & design EOIR Multi Sensor PTZ long range imaging systems. VEHICLE, LARGE VESSEL AND AIRCRAFT DETECTION RANGES IN EXCESS OF 45 KM KILOMETERS. 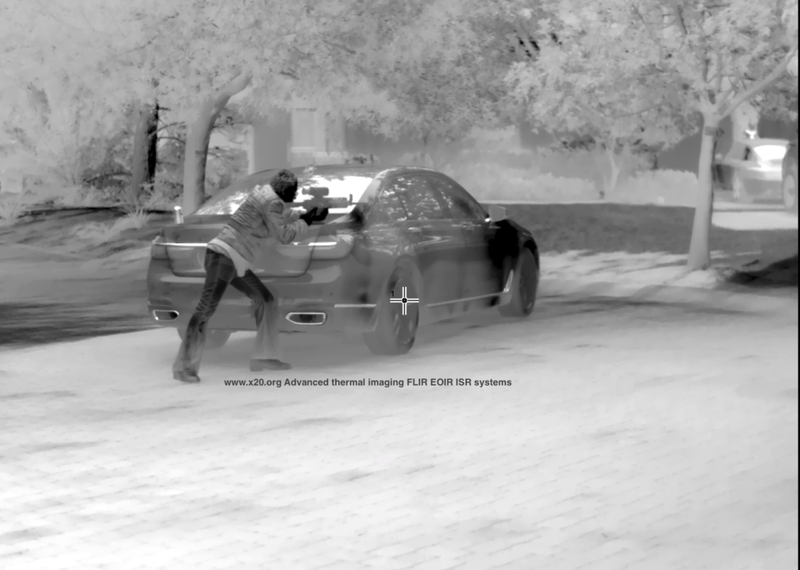 What the science behind a thermal imaging FLIR IR night vision PTZ pan tilt gimbal turret camera? This is where the image FLIR, MWIR, LWIR, SWIR, night vision, intensified, cmos, long wave, short wave, mid wave cooled and uncooled detector and sensors reside, CCD sensor, optical zoom germanium DFOV, TFOV, Fixed and CZ continuous zoom lenses, and the motors that control Zoom and Focus are located. 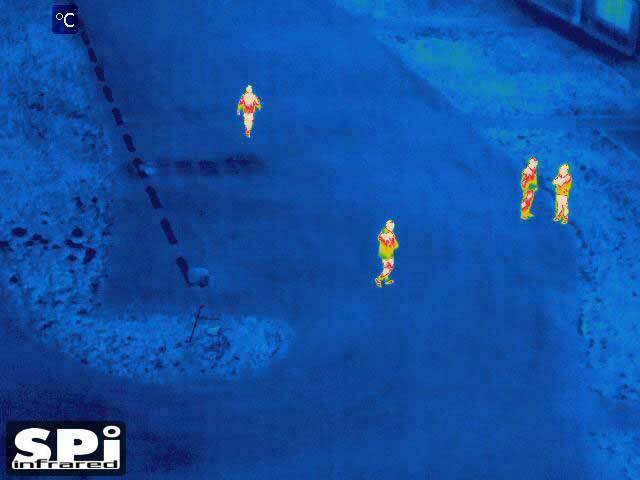 (d) PTZ motors – are the small motors that allow the thermal FLIR and CCTV HD camera to perform up, down, left and right functions. Marked by the arrows are two step motors; the one to the top controls up and down movements and the one at the bottom controls left and right movements, some systems have no motors and other methods of moving the cameras PTZ, some use brushless motors. ①DataH、DataL is 0~36000 hexadecimal corresponding pan 360 degree .